They were the original kings of the race track, but you won’t ever find a replica of one hanging out at your local cafe bike meet. 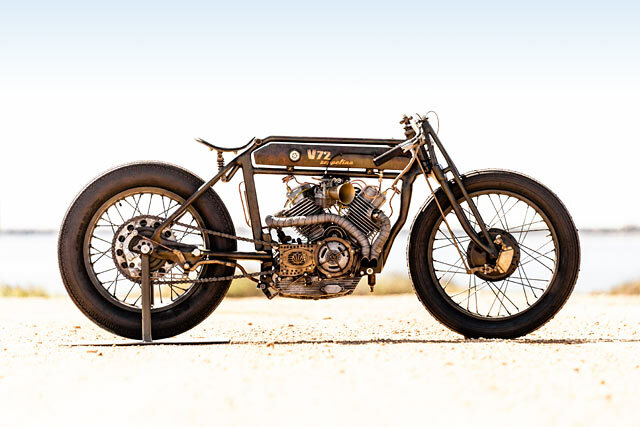 However over recent years with TV shows like Harley and the Davidsons and Sons of Speed, along with the input of America’s best builders like Billy Lane and Rick Petko, the board tracker is back with a vengeance. But what do you do when you live in a country where finding a ?20s Indian in a barn is as likely as finding the fabled pot of gold at the end of the rainbow" You do what Spain?s Kacerwagen Cycles have done and build your own from scratch; it?s a bitchin? boardie called ‘The Zeppelina V72’. Giant’s of the industry, Harley Davidson and Indian, made their names by winning on Sunday and selling on Monday in the highly lucrative sport of board track racing at the start of the 20th century. Crowds of nearly 100,000 people would pack into the biggest tracks and the prize money was out of this world. But two world wars, huge track maintenance costs and horrific deaths ? both on the track and in the stands ? put an end to the sport. But as the custom scene has looked back through the ages for inspiration it was only natural that eventually some would land back where it all began. For Gsus Valencia from Mazagón, Andalusia, on the Atlantic Coast of Spain, everything about those early Indian race bikes got his blood pumping. His workshop, Kacerwagen, turns out a range of tasty customs based on bikes old and new. But for this project it would be a case of building the chassis, sourcing an engine and then making do with whatever else he could find. ?Gsus made a wise choice from left field; a 350cc V-Twin from an off-road Moto Morini Kanguro 350.? Like all board trackers, they begin and end with the engine; going around a steeply banked track as fast as you can meant the first thing on the bike lift is the motor and everything else is just adapted to fit. But without access to any hundred-year-old Indian engines, Gsus made a wise choice from left field; a 350cc V-Twin from an off-road Moto Morini Kanguro 350. Yes, you read that right. The format looks the part, it has the perfect soundtrack and it even has some old school pushrod charm. So, after a rebuild to ensure it was running reliably and pumping out more power than the original racers with less than half the cubic capacity, attention turned to dressing it up. The block, jugs and valve covers were all ground back and shaped to give it a vintage-style look. While extensive use of brass on the side covers, clutch cover and in the form of beautiful inlet trumpets give it the perfect period feel. The short side exit exhaust ? all wrapped up and barking mad ? giving the boardie a booming, beastly beat.